i am wondering what the autobot leadership looks like. 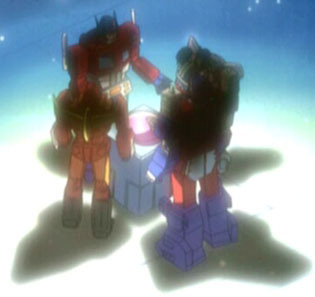 what i do know is that it started with optimus prime, then rodimus prime and then optimus took back the matrix. after that, i know that fort max lead the autobots in "the headmasters" following that, ginrai lead the autobot godmasters in "super god master force" after him came star saber in "victory" and dinally dai atlas in "zone"
i am wondering who came before these and who came after rite uup to lio convoy becomming the supreme commander. also, where does thunder clash come in to the line and at what point did star convoy take leadership? Here's what I can gather. Thunderclash is the leader of a six-member (himself included) subgroup of Autobots called the Turbomasters. witch part of g1 did the terbo masters exist in? are you just wanting leadership for the G1 universe? cuz i know the Unicron Trilogy leadership like the back of my hand. at the moment i'm just after leadership for g1/g2. in the armardaverse rodimus and optimus both lead the autotots. rodimus just chose to leave the planet to escape the fighting. before rodimus and optimus there were leaders though. after all, omega supreme and the four guardians of the super energon were before rod and op. they would had a leader. also, the furst would have been prima as primus as well as the original thirteen exist in all continuams simaltainiously. to be honest i would not be shocked if there was a sentinal prime in the armadaverse. i could be rong, but the maximal counsle are leaders rite? also in the armardaverse the four planet leaders. scourge of jungle planet, override of speed planet, metroplex of gigantian and evac of earth. they descended from the autobots that colonised the four worlds in the four ships that constitute the ark. logic dictates that a autobot leader would have existed to send them off. i would prosume prima as they left verry early in cybertron's history. lioconvoy wrote: witch part of g1 did the terbo masters exist in? They don't exist in the cartoon continuities. HOWEVER, the Japanese counterparts of four of the Turbomasters (the four cars and neither Thunder Clash nor Rotorstorm) were known as the Road Army Corps., and took part in the Operation Combination storyline, which followed the Return of Convoy story and preceded the Japanese G-2 fiction. During this time, they fought alongside Guard City, Sixbuilder, Sixturbo, Sixwing, and Sixtrain against the Decepticons Battle Gaia and the Jet Army Corps. (the Japanese counterparts of four of the Predators--the Turbomasters' enemies--minus Skyquake and Stalker). During this time, Star Convoy was still in command, but he wasn't in the story, as he said to be off fighting against the new Decepticon leader Scrash. lioconvoy wrote: i could be rong, but the maximal counsle are leaders rite? The Maximal Elders were said to be (one of) the ruling body/ies of Cybertron in the Beast Wars cartoon. They have never been seen onscreen. The Magnaboss components make up what is known as the Maximal Imperium, a different set of rulers, who were established in the IDW Beast wars comics. Magnaboss in combined form was also seen as a member of the Maximal High Council, another ruling body, in the 3H Beast Wars comics. In my lists, I was only going by what the Beast Wars cartoons said and ignored the Beast Wars comics for that moment. The Convoy Council is yet another ruling body and exists during the time of Beast Wars Neo. They are another triumvirate prominently headed by Great Convoy. After he was killed, Lio Convoy was appointed his position. lioconvoy wrote: i just remembered. Obviously not meant to be the same bots as those they resemble. The resemblance was likely done for fanwank. wasnt that picture seen in Cybertron? Wing Saber wrote: wasnt that picture seen in Cybertron? Yep. Primus showed it to them. in japanese continuity, "car robots" was a continuation from g1/g2. so where does that place fire convoy in the previous list sabrblade? also in a previous poast you mentioned that optimus primal was a leader. i'm not sure if that's entirely corect going by japanese continuity.